Let’s test the theory…so we hope so! But before we explain how we are going to get students to collaborate via our Online community forums, let me first explain the back story. The Senior Trainers at Monarch sat down at the CBD meeting room last week to discuss how we could improve our courses, the student experience ….the wow factor, the hamburger with the lot in other words. How could we WOW our students even more? Don’t get me wrong, we have passionately focused on this up until now, but the journey never ends – complacency is not an option. The big theme that came out of the meeting was students want ‘REAL’. They want real case studies, they want to ask questions of trainers with real work experience in the subject area. And then Lisa our General Manager asked a question which took us in a new direction. She said “…hey how many students doing our courses are actually currently working in the industry the course relates to”? Cynthia suggested anecdotally she thought in accounting and bookkeeping it would be around 40%. Ben and Josh said in financial planning they thought it might be closer to 50%. And our awesome new Small Business Management course … well we don’t know yet, but I’m sure we will have an idea very soon. Then we thought about the fact our students that do our courses range from 17 years old to 70 years old. Yes it’s precisely those extremes! They have such different backgrounds. Many have really interesting insight to bring to the table – many actually working in the industry to which the course relates. After chatting a little longer, it was agreed. For 2015 and beyond, we are going to genuinely try to encourage students to collaborate online with trainers and fellow students. So do we think it will work? To be brutally frank it is still a work in progress, BUT the great news is we already have a working (and well received) Online student forum embedded into each course via our Online Learning Management System called Moodle. It gets used by students right now to post questions. However, we want the community forum used MUCH MORE. We want students to be active in commenting on other student’s comments (….constructively) rather a Monarch trainer being the only key facilitator. We want thought provoking questions, in addition to questions relating to core subject matter. 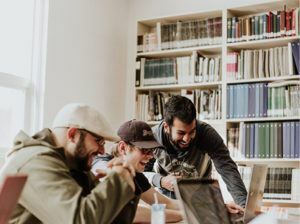 In other words, we want to create an Online student community where you can connect with other like-minded individuals on a similar path to you. We want you to learn from your peers AND learn from us. We want you to get MORE, simple. It is not about taking ANYTHING away to be crystal clear. You will still have telephone, email, online and direct forum access to your trainer – please don’t stress about that. So the big question is (….and yes we are consciously finishing this blog with a question), how do we get MORE students to engage in the Online community forum? We are aiming at 70% or more of our students. Is that ambitious? Sure, but we’ve got some ideas we’d love your feedback on. This blog will be posted on Facebook immediately so please provide feedback on our blog post on our Monarch Facebook page. Create a job/employment section where students can actively contribute about their experience in obtaining work or attempting to obtain work in the relevant course field. Have a quarterly prize for the student champion (in each course) who contributes actively and constructively to the student forum. Extremely high performing students (who also have relevant work experience) AND are prepared to do further training (at their expense) in a qualification in training and assessing would be offered an opportunity to be an Online facilitator (paid) on our community forums. Allow video posts to be uploaded by students to both ask and answer questions and comments instead of only typed questions and answers.